St John the Baptist Russian Orthodox Church in Singac, NJ is under the jurisdiction of Russian Orthodox Church, that was originally founded by immigrants from Eastern Europe in the early 1900's. Our parish is a product of two migrations. One from the continent of Europe and other areas of former Austria-Hungary (Galicia), Belarus, Carpatho-Russia (Czechoslovakia), and Imperial Russia prior to 1915; the other, from nearby Pennsylvania, a decade later. Difficult economic conditions in the Eastern European areas, governed by hostile anti-Christian and non-Russian rulers on the one end, forced many Russins to leave their homeland and seek their fortune in the New World, the land of promise and infinite possibilities for the ambitious and the energetic. Most of those from Russia proper had in mind to better their economic status and then return to their native lands, where with their new found wealth from their savings, they hoped to improve the standard of living for their families. In America, they usually found difficult and dangerous work, but were repaid with a better standard of living and complete religious freedom. Without fear, they were able to confess the Orthodox Christian Faith of their fathers. The first church organization in Singac was St Mary's Russian Orthodox Women's Society, founded in 1911. This was followed by the Brotherhood of St John the Baptist, organized in 1914, which was instrumental in organizing the parish in Singac. In 1915 the founders decided to build a church so that the Orthodox faithful in Singac and surrounding communities would have a place of worship. During the phase of planning for a church structure, services were held in the homes of Mr Havrill Dutkevich and Mr Theodore Rock and were conducted by Father Alexander Alehin of Garfield, NJ. Two lots at the corner of Weaver Street and Van Pelt Pace were donated by Mr B. Grunauer. Plans were immediately drawn for the construction of a small wooden church. The foundation for the church was completed by voluntary offerings of the parishioners, as well as their own labor. One of the parishioners, Mr John Kobelka, then agreed to construct the church edifice for $2,500. The first church of St John the Baptist was completed shortly thereafter. The solemn celebration of the blessing of the cornerstone and consecration of the church took place on June 28, 1916. St John the Prophet, Forerunner and Baptizer of Christ, was adopted as the patron saint of the church. Officiating at the ceremony were the Archbishop Alexander (Nemolovsky), Archbishop of North America and the Aleutian Islands of Russian Orthodox Church, with the Dean of New Jersey, Father John Krochmalny, Father Serge Snegireff, Father Joseph Stephanko and Father Alexander Alehin in concelebration. In 1917 the Russian School Program was initiated for the youth. In 1919-20 the iconography in the interior of the church was done by the Rector, Archimandrite Nikifor (Kapitanchuk). The church choir was organized. The First Russian National Home was also instituted. The wooden parish rectory was built on Weaver Street in 1921. 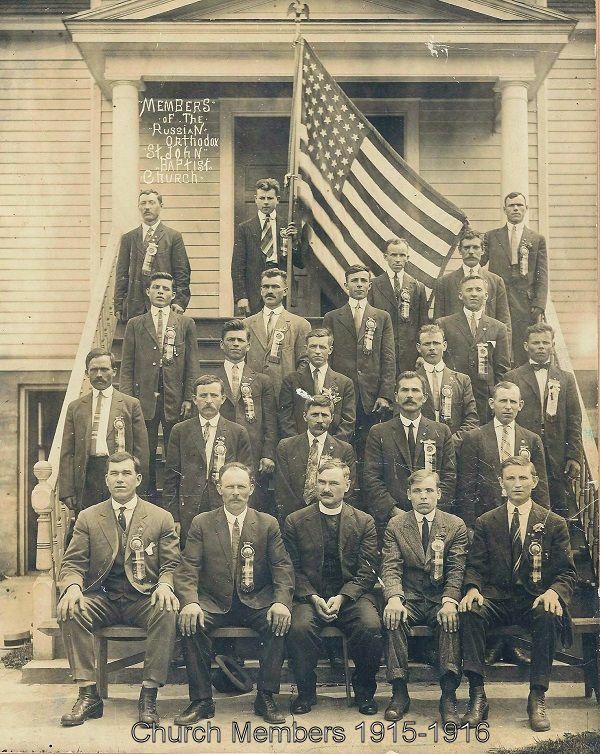 St Michael's Society was organized in 1925. In 1926, three bells were purchased for the church for $1,350 by several church organizations and individual parishioners. In 1927 the Senior 'R' Club of Singac Chapter #44 of the Federated Russian Orthodox Clubs was organized, and in 1930 St Anne's Altar Society was formed. In the years that followed, there was an influx of people moving into the Singac area, so that the parish grew from the original 29 families to a community of approximately 200 families in the 1940's. This raised the need for a larger place of worship. From the discussion at a special parish meeting held on June 22, 1947, it was decided to poll the parish on building a new and larger church, as well as obtaining financial support in the form of pledges. The response was positive on both issues. The decision to build a new church at Weaver Street and Van Pelt Place was made at the annual parish meeting held on January 29. 1950. The Building Committee (Mr Peter Kolanich, Mr Stephen Dutko, Mr John Kulick, Mr Walter Kusha, and Archpriest Peter Karel) were empowered to obtain plans for the church. At the special parish meeting held on September 30, 1951, the Building Committee was authorized a $125,000 expenditure for the construction of the church. In 1951 the Junior 'R' Club of Singac, Chapter #44 J of the Federated Russian Orthodox Clubs, was instituted. The architectural firm of S.E. Greydanus & Son was hired to draw plans and specifications for the new church. Prospect Builders, Inc. was contracted for the construction of the new church. The last Divine Service in the old church was held on June 22, 1952. The C & W Wrecking and Trucking Co. began dismantling the old church on June 24, 1952 and completed the operation on July 5, 1952. The ceremony of groundbreaking for the new church was held on July 6, 1952 with Fr Peter Kohanik, Dean of New Jersey, V. Fr Luke Olchovy, Fr Simeon Nemetz, Fr Emil Skuby, and Fr Peter Karel, concelebrating. Bonds were issued to parishioners on a voluntary basis in order to raise the necessary money for construction of the church. The construction began on July 8, 1952. With the Archpastoral blessing by His Eminence Leonty, Metropolitan of the Russian Orthodox Church in North America, the dedication of the cornerstone was celebrated by Dean of New Jersey, Archpriest Peter Kohanik, who was assisted by Archpriest Basil Lisenkovsky, Archpriest Luke Olchovy, Archpriest John Telep, Archpriest Simeon Nemetz, Fr Michael Chanda and the Rector, Archpriest Peter Karel, on October 12, 1952. During the period of construction, church services were held at the Singac Public School (July and August 1952) and the Singac Firehouse (September 1952 - April 1953). The first service in the new church was conducted in the basement on April 2, 1953. On November 8, 1953, Metropolitan Leonty gave his blessing for the new church edifice. On October 3, 1954, with the blessing of His Eminence Leonty, Metropolitan of the Russian Orthodox Church in North America, His Grace Benjamin, Archbishop of Pittsburgh and West Virginia celebrated the dedication of the new St John's Church. In March 1955 the Home and Church School Group and the Junior Choir were organized. Having met the outstanding mortgage on the church, a banquet for the burning of the mortgage was held on June 6, 1956. In December, 1957, the church entered into a contract with the Matthews Millwork Company of Luzerne, PA., to construct a new iconostasis for the church at a cost of $9,500.00 and for it to be completed by April 10, 1958. The contract was signed by the then parish president John Sardinsky, Jr., and the rector, Fr Peter Karel. The iconostasis is still in use in the church and in March 2014 restoration work began on it. Then on August 7, 1958, the church entered into another contract with Matthews Millwork Co. for an altar, “52”X 52” x 42”, and also for a table of oblations to be 44” X 28” X 40”. A solid oak iconostasis, the Altar and the table of Oblation with ornate carvings were purchased to replaces the plywood panel temporary pieces, and the interior of the church was renovated in the late summer of 1958. On October 5, 1958 His Grace Dimitry, Archbishop of Hartford and New England, celebrated the dedication of the renovated church in concelebration with the Rector, Fr Peter Karel, and visiting clergy of the New Jersey Deanery. In the summer of 1962, the parish purchased a parcel of property 100 X 125 feet, situated directly to the back of the sanctuary of the church, from our parishioner Mrs Amelia Kobelka. The house on the property provided living quarters for the Choirmaster and classrooms for the Church School Program. Another parcel of property of 2.25 acres was purchased from our parishioners, Mr & Mrs Walter Kusha and Mr & Mrs John Rock. It is used as a picnic, recreation, and parking area for our church functions. For many years commentary centered on the need for a good rectory and a youth center for St John's Parish. It was evident that a rectory was needed, as well as classrooms for the Sunday School program, a meeting place for our parish organizations, and a center where we could meet and get to know each other better. At the church committee meeting on February 12, 1968, serious discussion considered the plausibility of a building program for the continued growth of Orthodoxy at St John the Baptist in Singac. A Master Planning Board was appointed by the President, Mr Peter Kolanich: Dr George Beskid (Chairman), Mr Michael Humecky, Jr, Mr Eugene Kulick, Mr Theodore Melnick, and Mr Afton Romanczak. Within weeks the Church Committee found itself receptive to the proposed building plans set forth by the Master Planning Board. The Board was directed to present their findings, plans, and estimated costs at a special parish meeting called by the Church Committee for April 7, 1968. The Church Committee also approved that presentation drawings be made by the architectural firm of Valk and Keown for this special parish meeting. At the meeting, a lengthy discussion ensued. In the deliberation, the subjects included topics for a new rectory, a house for the choirmaster-psaltis, Sunday School classes, auditorium, kitchen, and meeting rooms and other incidentals. Because of the difficulties in obtaining a full-time choirmaster-psaltis and the additional cost involved in planning a residence for one, it was resolved that the building program included only a new rectory and education-recreation center. The meeting participants approved the tentative plans, specifications and the estimated construction costs for the two edifices. At the subsequent special parish meeting on May 26, 1968, it was reported that the estimated costs would be approximately $285,000 - $35,000 for the rectory and $250,000 for the center. The old parish home was demolished on November 29, 1968 by V. Ottilio and Sons, Paterson, NJ. The groundbreaking ceremony was held on December 1,1968, officiated by His Eminence Jonathan, Archbishop of the Exarchate of the Russian Orthodox Church in America, and assisted by Archpriest George Burdikoff, Chancellor of the Exarchate, Archpriest Dennis Havriliak of Sts Peter and Paul Cathedral in Passaic, NJ, and Fr Michael Kiriloff, Rector of St. John's. Construction began on December 12, 1968 by Mel McClure of Pequannock, NJ. The rectory was completed by May 27, 1969. As the rectory was being erected, bids were received for the construction of the education-recreation center. At a special parish meeting held April 27, 1969, the expenditure of $266,000 for the center was approved. The 'Blessing' of the rectory was celebrated on Sunday, July 6, 1969, after Divine Liturgy, by His Grace Alexis, Bishop of Philadelphia, officiating, and assisted by Archpriest George Burdikoff, Dean of the Eastern States Deanery, Archpriest Basil Kreshik of Bayonne, Fr Emil Minkovich of Elizabeth, and our Rector, Fr Michael Kiriloff. Also present was the Mayor of Little Falls, Mr. Charles Pullara. On the same day, groundbreaking ceremonies were held for the education-recreation center. The firm of Schleifer Bros. of Hanover, NJ, was awarded the contract for demolition of the "green house" on Tolstoi Place, and erection of the education-recreation center. Demolition of the "green house" occurred on June 3, 1969, and construction of the new center began on June 10, 1969. The center was completed on April 17, 1970. The official dedication of this most impressive structure and the placing of the cornerstone was celebrated on September 12, 1970 by His Grace, Bishop Makary, Administrator of the Patriarchal Parishes, blessed and dedicated the Educational Center with the assistance of the Rector of the parish Archpriest George Burdikoff. ​Help us write the next chapters, become part of our history!.. Click here to view some of the pictures of the founders and first parishioners of St John's.